You've never seen Voltron like this! The Ultimate Voltron you need for your collectiion! All 5 lions come apart with multiple points of articulation! This is Voltron as you've never seen before! 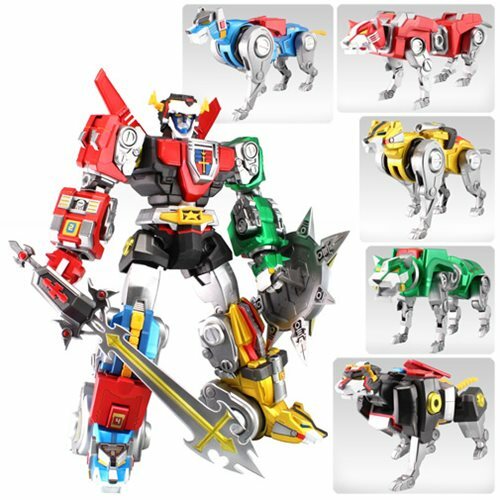 The 5 lions will form Voltron, and each transforms separately into their own anatomically correct stance. Includes shield and sword accessories. This Toynami interpretation that captures the Voltron essence of power and might, the Ultimate Edition is a massive 16-inch tall piece that pays tribute to the handsome musculature of the lion. Each hyper-articulated lion can be posed in multiple ways, even sitting down! Fully transformable and constructed of sturdy POM and ABS plastic to allow for high posability. Ages 15 and up.